Email skews older – and is for ‘work’: Most students use Facebook and texting (and secondarily voice calls), to communicate with friends. Students use email to connect to their professors and their jobs. Email’s greater formality, and more flexible space for writing copy or attaching documents, has come to fit a ‘work’ need better than students’ 24/7 on-demand ‘social’ needs. Email remains in the rotation of communication options: The number of emails students send daily may be dwarfed by the number of texts they send or the posts put up on Facebook, but for many students email is running in the background of their computers and phones. 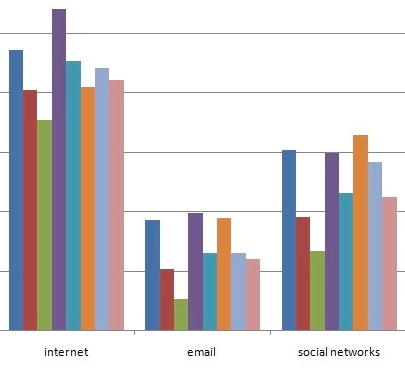 Students reported that they were often simultaneously on Facebook, Twitter, Skype, and/or other chat and IM or SMS systems, together with email. The voice of AOL pinging in with “You’ve got mail,” may seem a quaint anachronism, but many students get beeped when a new email comes in. Students remain eager to “get mail” and worried about how swamped they’ll be with messages if they neglect their account for a day or more. Emails are less for casual use than for communicating in a work environment: Students expressed their worry that while they were ‘unplugged,’ they would miss important and necessary information or would not be able to submit assignments to professors and work supervisors. Facebook and texting were the ways to catch up with most friends; email was the way students communicated with their “professional” circle of associates. Email is habitual; it’s a way of getting important (if not breaking) information: Regardless of which home country they were from, students reported on their habit of checking their email right when they wake up and then regularly throughout the day for updates in information. Although students may check their email accounts often – and may have alerts set on their computers to notify them when a new message comes in – email is less for breaking news, than for information. The brevity and speed of Twitter and chat/IM make those platforms more amenable to occasions when students want rapid back-and-forth conversation. Subconscious email lapse: Americans, especially, lapsed and ended up checking their emails – although quite a few argued that they had done so by unconscious habit.